Dim Sum is more than Chinese Food... It's a Fun, Lively Dinning Experience! Let's go for Dim Sum! The very words that get the kids out in a hurry! Dim Sum is probably one of their favorite Chinese Foods, and for Chinese around the world, Dim Sum is more of a social occasion when family and friends gather to enjoy the endless repertoire of delightful dumplings and little bites served in the bamboo baskets and the fun hectic atmosphere at the restaurants. 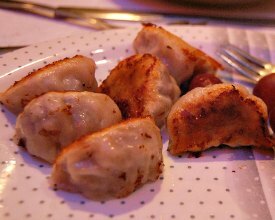 In fact, that is one of the unwritten rules, the more people in the group the better so more different types of dumplings can be shared by all. 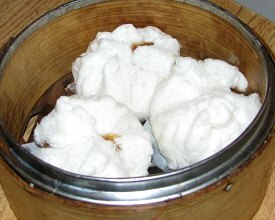 Traditionally Dim Sum is served for breakfast or brunch, but nowadays we see it served at many restaurants around the clock. The dumplings are certainly a full meal. They can be stuffed with meat, chicken, shrimp, and vegetables. Some are sweet and served as dessert. Some are served warm, some are served cold. 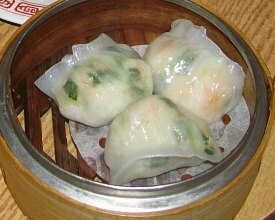 Dim Sum is traditionally served with tea. 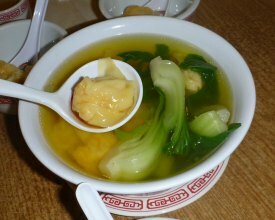 Some of the most common types that kids will enjoy are the pork dumplings, siu mai, and shrimp dumplings, har gau. 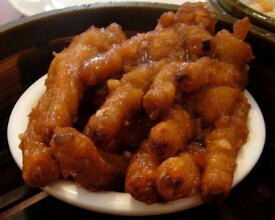 There is of course the usual spring rolls, and some other "exotic" regulars like chicken feet. 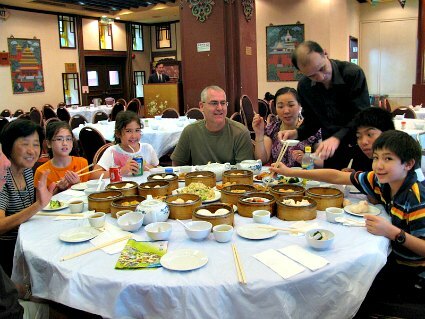 Besides all the different kinds of dishes they get to try, kids also enjoy the way dim sum is served. At many restaurants the dishes are carried in trolleys and the trolleys come around the tables where you just point at whatever dish you want to try next. You will notice that the food in the trolleys is always piping hot and it goes quickly. There is no risk you will get a luke warm dish. In fact, sometimes you see people getting to the trolley instead of waiting until the trolley comes to the table. This is perfectly acceptable, but in crowded conditions it is better to let the trolley come to you. Other restaurants do not have the trolleys and you have to order a la carte. 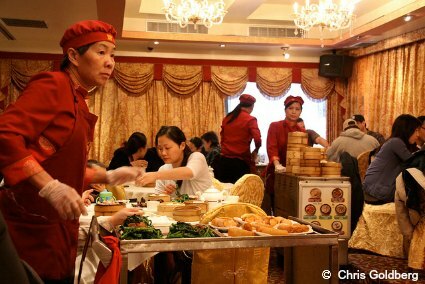 You tick on the pre-printed checklist that contains all the different types of dim sum, the kind and quantity of what you would like to have and then your order is brought to your table. A tab is maintained at each table that keeps track of what has been consumed or the check is later computed by counting the number of empty baskets or dishes at your table. Below is a picture guide of some of the most common dim sums so you can familiarize yourself if this is your first time trying it! 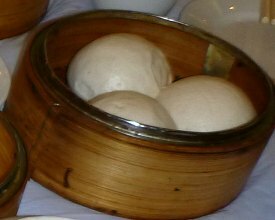 There are many kinds of Dim Sum which are normally served in small portions of 3 or 4 pieces each or small plates. Dim Sum can be dipped in your favorite sauce. Some common ingredients for dipping are soy sauce, sesame oil, vinegar, chilli sauce or paste. 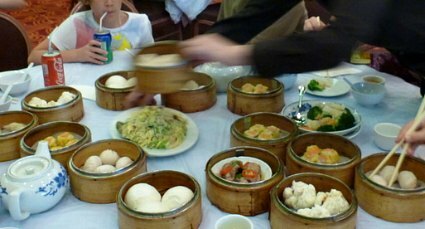 These are some of the most popular kinds of Dim Sum which you are likely to see at any dim sum restaurant, whether it is your local dim sum dig, in Chinatown or in the middle of Hong Kong. These are one of the favorites. 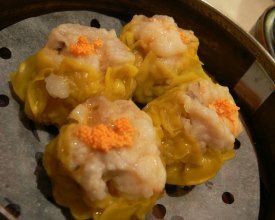 Siu Mai is steamed and made with pork, sometimes also chicken and shrimp in a thin wheat flour wrap. My son's favorite and a very popular one. 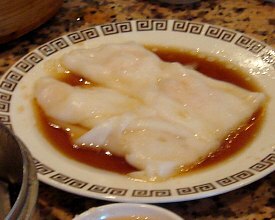 Also steamed, Har Gao is made of shrimp, wrapped in a thin translucent rice skin. Very delicate flavor. The fluffy and spongy steamed buns are filled with our favorite meat, char siu. 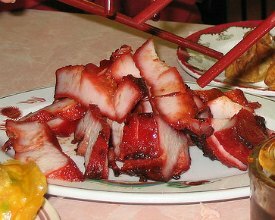 This is the typical reddish Hong Kong-style bar-b-que pork, spicy and sweet. 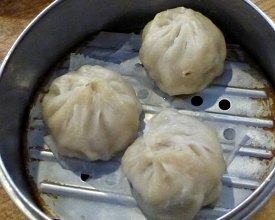 The same filling used for the steamed pork buns is used here, the buns are baked in the oven rather than steamed and drizzled with honey or sugar. This is one of my favorites. Similar to Har Gao, except it adds some chives for extra zest, sometimes bamboo shoots add a little crunchiness. Chicken or pork, Chinese mushrooms and bamboo shoots are wrapped in thin tofu skin and then steamed and served in its own sauce. Very flavorful! The kids call it Chinese Tamales. 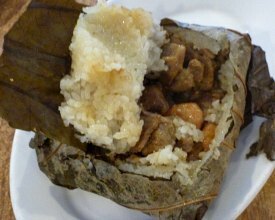 Glutinous sticky rice with a filling ranging from chicken, pork ribs, Chinese sausage, salted egg, shrimp, dried shrimp, Chinese mushrooms. All steamed in lotus leaves, sometimes banana leaves are used. VERY filling. You might want to leave this for last! 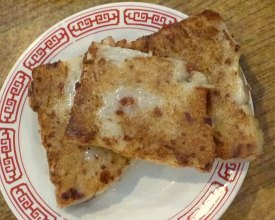 Another favorite, made with shredded turnip, actually Chinese radish, and rice flour, mixed in the dough are tiny pieces of shrimp, pork, mushrooms, sausage. Mixture is steamed, then cut into squares, the squares are pan-fried before serving. Crispy in the outside and soft in the inside. 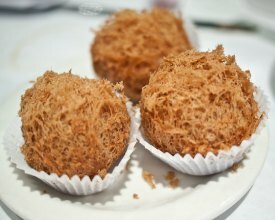 Can also be made with taro. Eggplant stuffed with shrimp, first lightly pan-fried then braised and served with its own sauce. 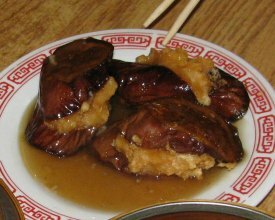 The thin long Chinese eggplant is used. We all love this one! Even the most picky eater will have some spring rolls! 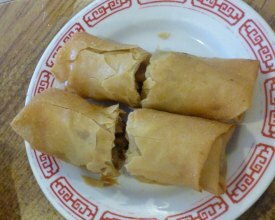 They are filled with chicken, pork, or just vegetables, wrapped in a thin flaky wrap and deep-fried to a crisp. 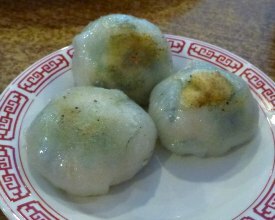 The vegetarian favorite, the chive dumplings are first steamed and then lightly pan-fried so they are crispy in the outside with a moist and tasty filling. Sometimes bamboo shoots are added. These delicate rice rolls can be filled with meat or shrimp. The wrap has a consistency similar to lightly poached egg whites, they are topped with a thin sweet soy sauce. 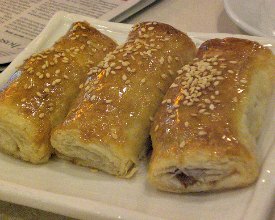 Again, the same char siu filling, this time wrapped in a flaky pastry, baked to a crisp, drizzled with egg whites and topped with sesame seeds. 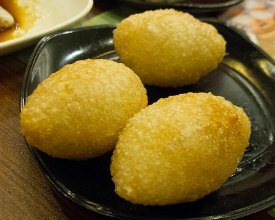 Deep-fried Glutinous Rice Balls The filling is pork, beef or chicken wrapped in a thick layer of glutinous rice then deep-fried. The outer wrap is crispy and because of the thickness rather chewy. 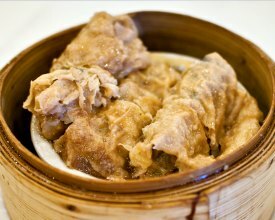 A filling of pork and mushrooms covered in mashed taro deep-fried to a fluffy and crispy crust. The outside is light and crunchy, the inside juicy and savory. 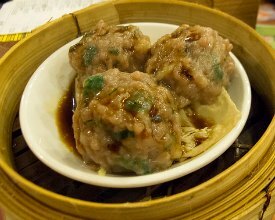 Wrapped in a bed of tofu skin, minced beef and spring onion balls are steamed and flavored with soy and Worcestershire sauce, sometimes oyster sauce. 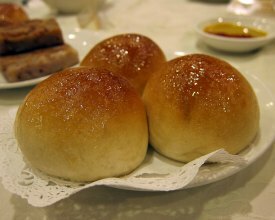 The following are often served in Dim Sum restaurants although they are not considered "traditional" Cantonese Dim Sum. Filled with pork and a rich broth, sometimes also called broth dumplings, these steamed dumplings are very popular in Shanghai and one of our favorite street foods. 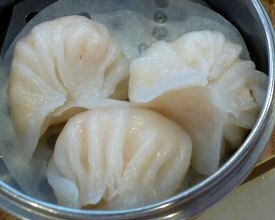 Very popular throughout China and Asia in general, these dumplings, often filled with pork, are steamed and lightly pan-fried on one side, very popular street food also. Char Siu is that delicious glossy red-coated barbeque pork. 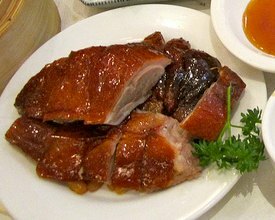 The sauce that gives it that unique sweet spicy flavor is made with hoisin sauce, rice wine and honey. Another popular with the crispy skin and juicy and flavorful meat. Some restaurants specialize on this dish alone, they will have the ducks hanging in the front window. First deep-fried then stewed and served with a flavory sauce. Very unique consistency, be ready for tons of little bones. Sometimes served cold. Definitely an acquired taste. 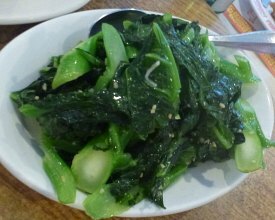 Bok choy, gai lan, spinach, or watercress stir fried with garlic, or sometimes steamed with oyster sauce are very popular. It complements the Dim Sum meal quite well. 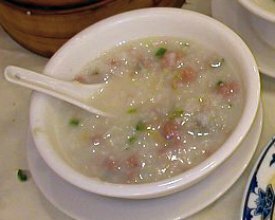 An all-time favorite, Wan Tan soup is made with dumplings filled with shrimp, pork and spring onions, wrapped in a thin flour skin and boiled and served in the broth. Fresh vegetables or noodles are sometimes added. Rice and noodles are considered the "fillers" and normally served at the end of a meal. In the West, they are served as accompaniment to the meal. 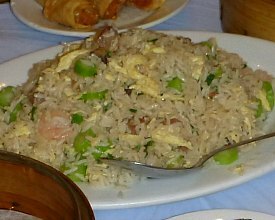 Pork, chicken, egg, peas, scallions, Chinese sausage can be stirred in the rice. 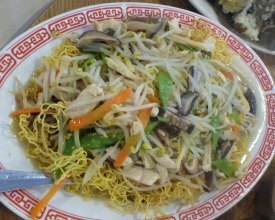 All kids love fried noodles, you can order with seafood, char siu, vegetables, soy bean sprouts, chicken, and all of the above. A Chinese staple and popular for breakfast. Tiny chunks of seafood and meat are added with spring onions and topped with crispy deep-fried "doughnut" stripes. The favorite dessert. 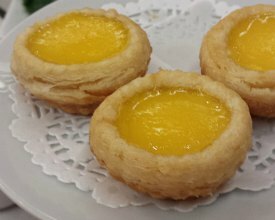 Egg custard baked in a nice crispy crust. They literally melt in your mouth. 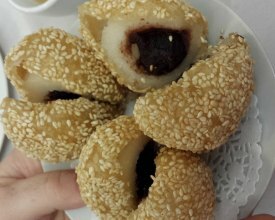 Balls of glutinous rice are deep-fried and rolled in sesame seeds, the filling is red bean, lotus or black sesame paste. 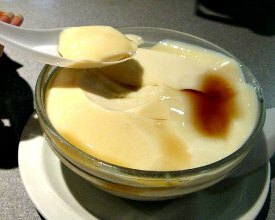 Silky tofu, almond pudding, coconut jelly, all very delicate and topped with fresh fruits or a light syrup. These fluffy buns are stuffed with a sweet filling like red bean paste, egg custard or black sesame.